Megan Foster’s work suggests a narrative by presenting a frozen moment in time. She aims to preserve and give authority to the everyday experience through a mix of art, architecture, design and science. Using appropriated images, film stills, magazine clippings and staged photographs as a starting point, she depicts banal scenes that have the potential to be spectacular and fantastic. She portrays often-overinflated expectations of the way we live and how we try to better ourselves from previous generations. 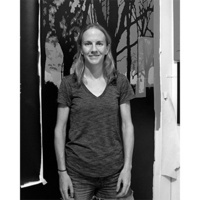 Megan Foster earned her BFA from RISD and her MFA from Columbia University. Her work has been included in exhibitions at Black and White Gallery, Brooklyn, NY; Mixed Greens Gallery, NYC; PS1 Contemporary Art Center, Long Island City, NY; Inside-Out Art Museum, Beijing, China; and the San Jose Museum of Art, San Jose, CA, among other venues. Before joining the faculty at RISD in the fall of 2016, Foster taught at The City College of New York where she was the head of Printmaking and director of the MFA program. She was also master printer at the LeRoy Neiman Center for Print Studies and is the co-founder of Moonlight Editions.